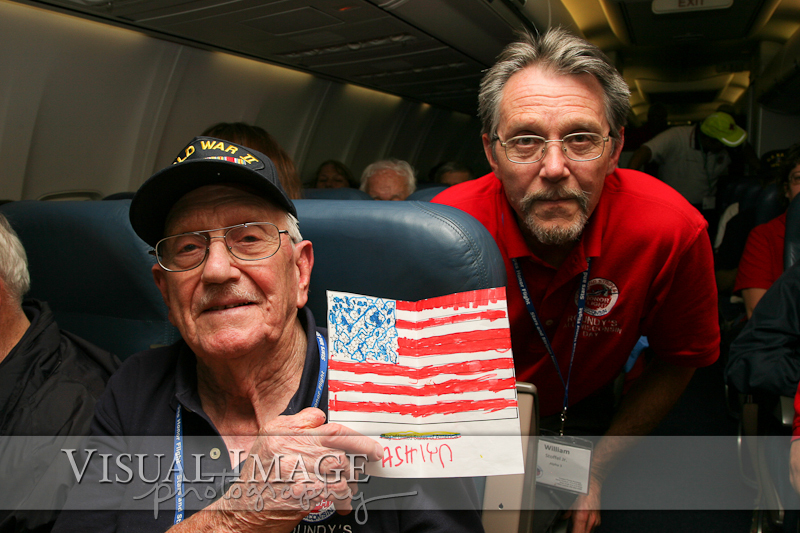 On October 8, 2011 the Stars and Stripes Honor Flight flew 400 veterans from the state of Wisconsin to see the World War II Memorial in Washington, DC. 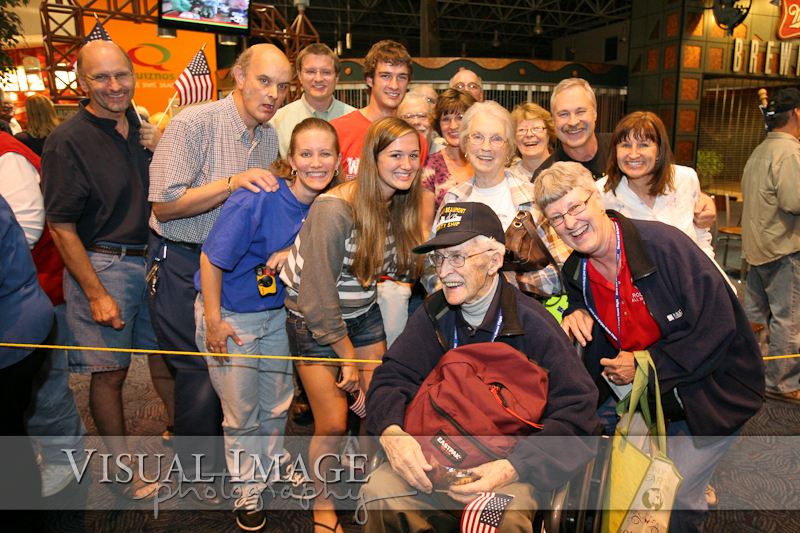 These heroes were able to visit their memorial on the National Mall, and the Iwo Jima Memorial. 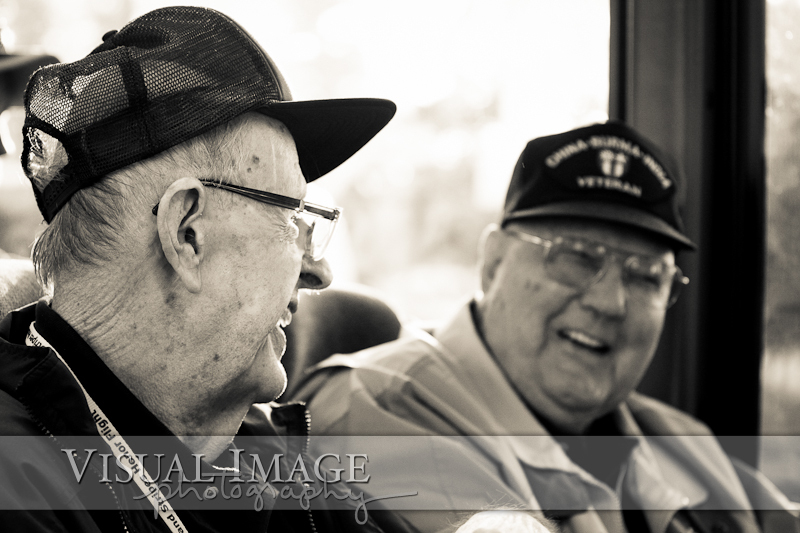 They were also able to watch the changing of the guard ceremony at Arlington National Cemetery. 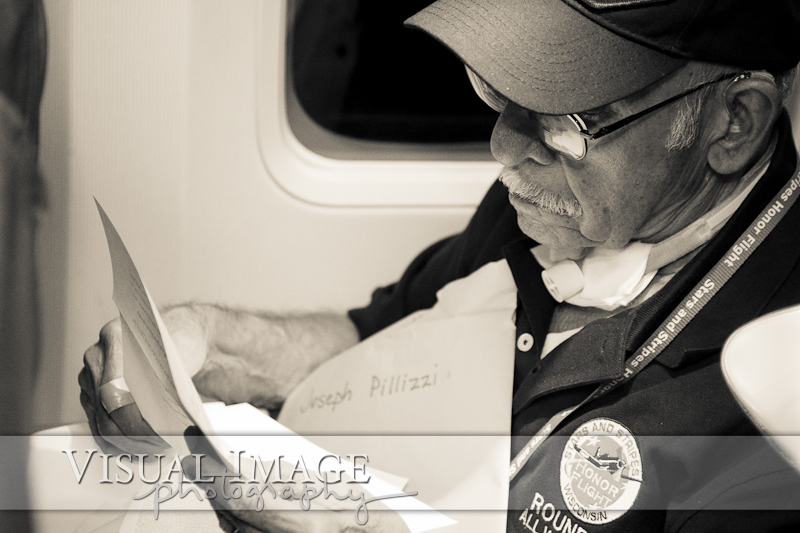 After a long day on this one-day tour of our nation's capital, we boarded two planes at Dulles International Airport to head home. 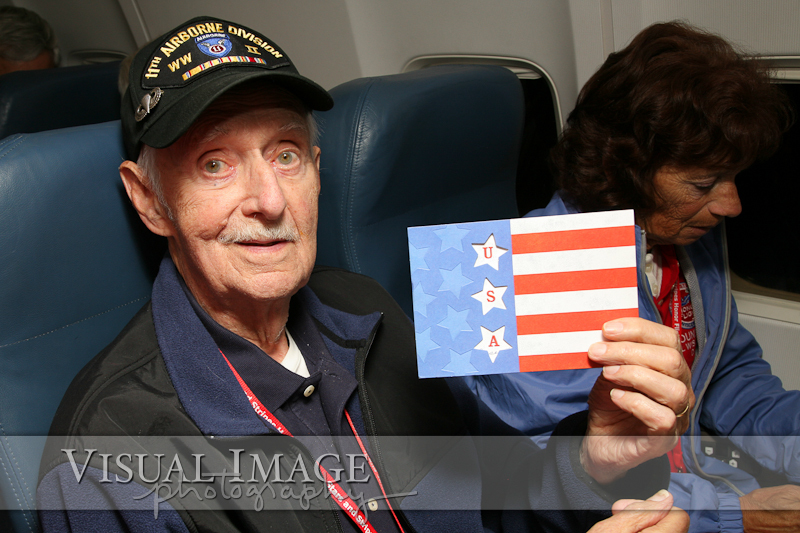 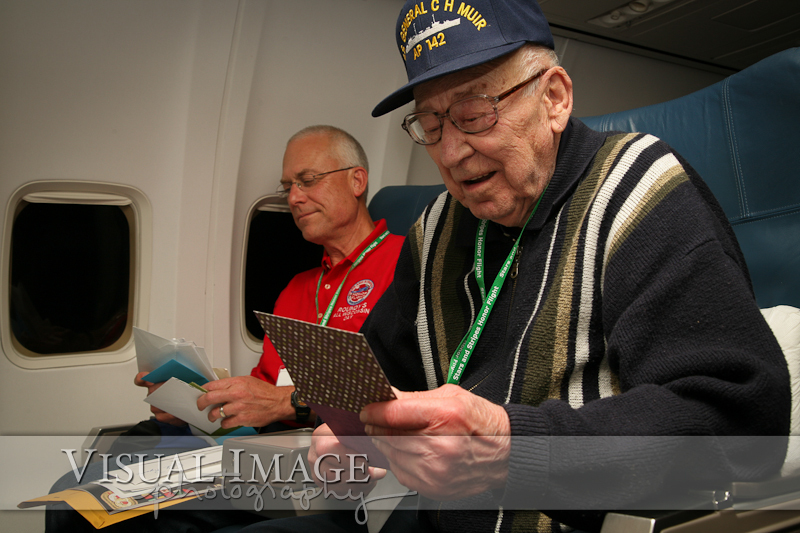 During the return flight, there was a traditional mail call where each veteran received a package of mail from their family members and loved ones. 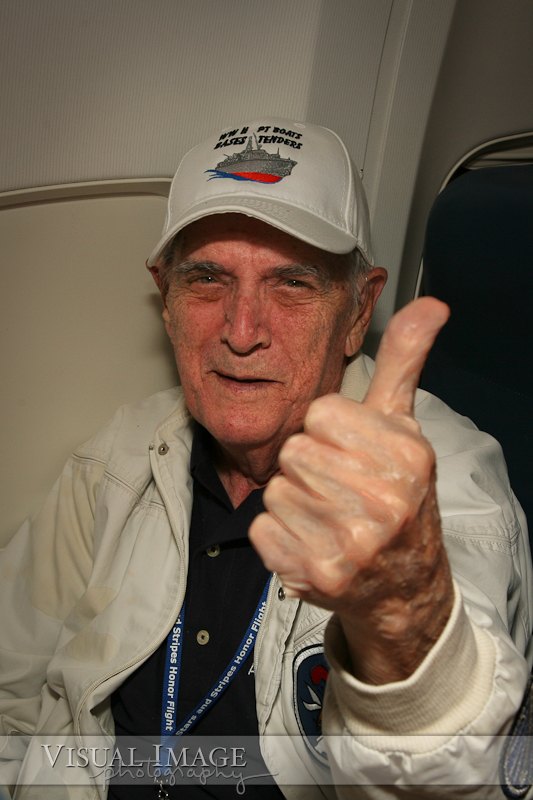 Carl Zimmerman called out names over the plane's intercom on the Bravo flight. 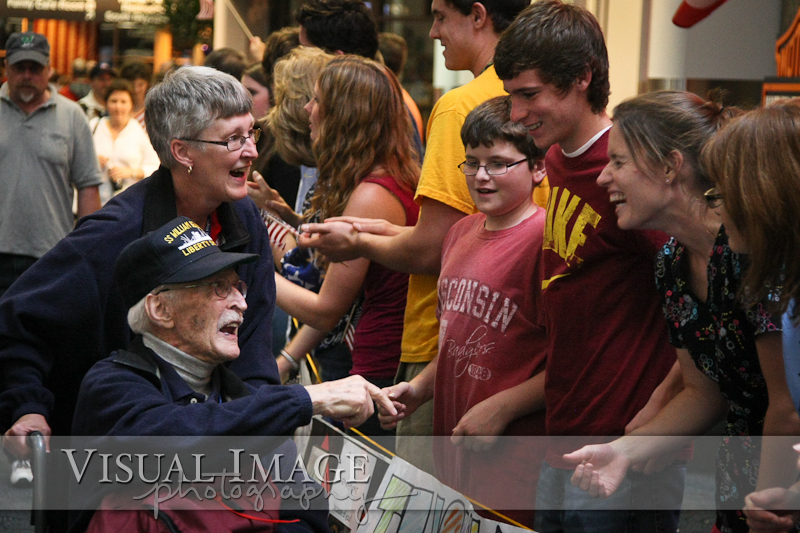 You may have known him when he was a Milwaukee news anchor for WITI-TV6, but Carl is also a WWII veteran. 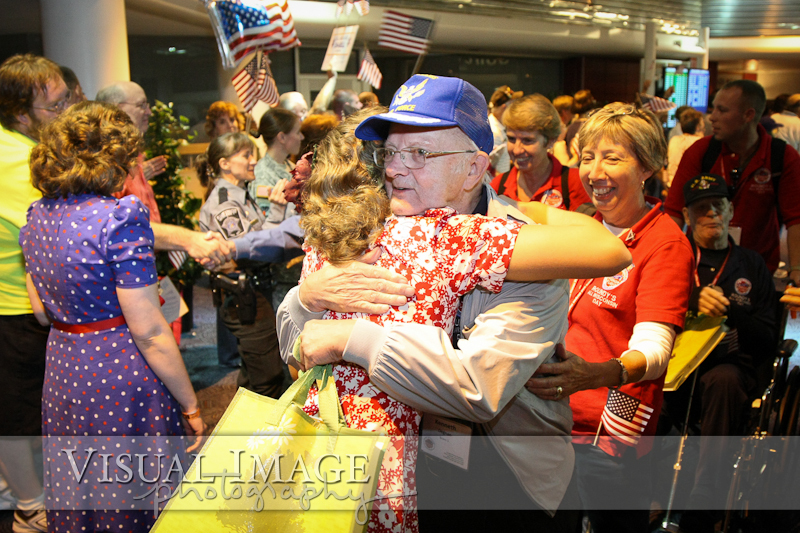 His son, Richard, was able to be his guardian on the Honor Flight. 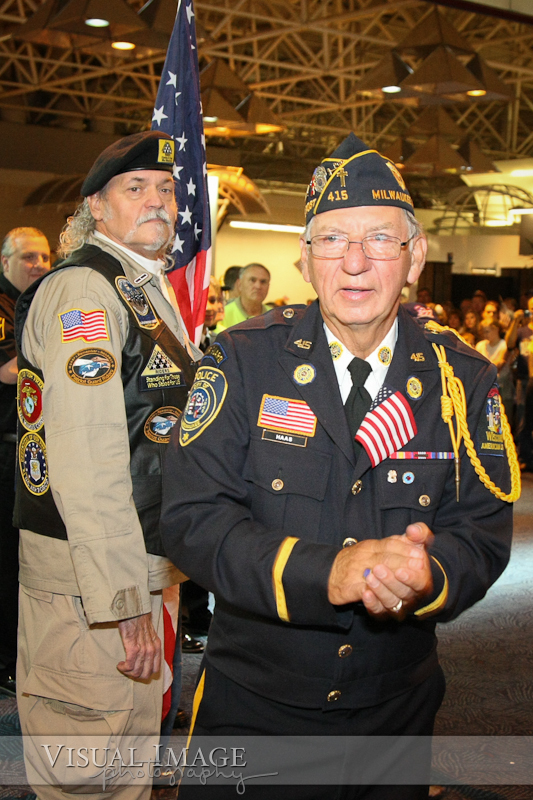 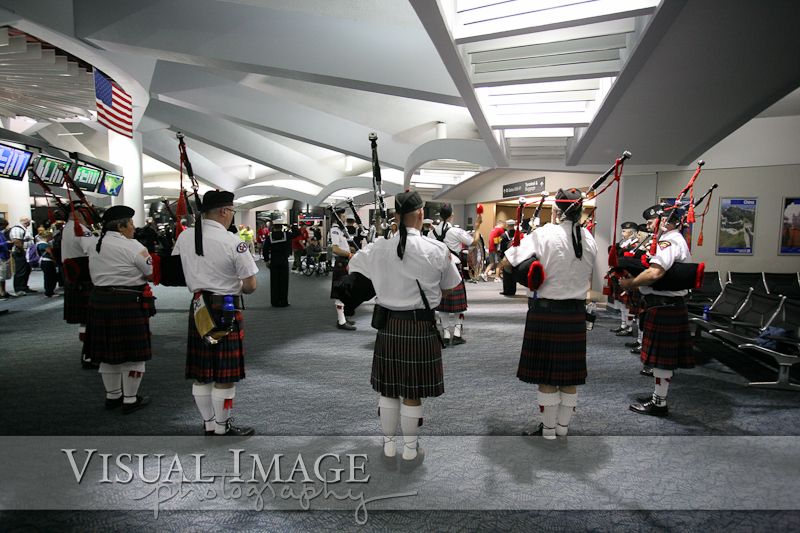 When the planes landed in Milwaukee, the veterans were greeted in the terminal by a walkway filled with military personnel, the Greater Milwaukee Fire & Police Pipes & Drums, and cheerleaders from Cedarburg High School. 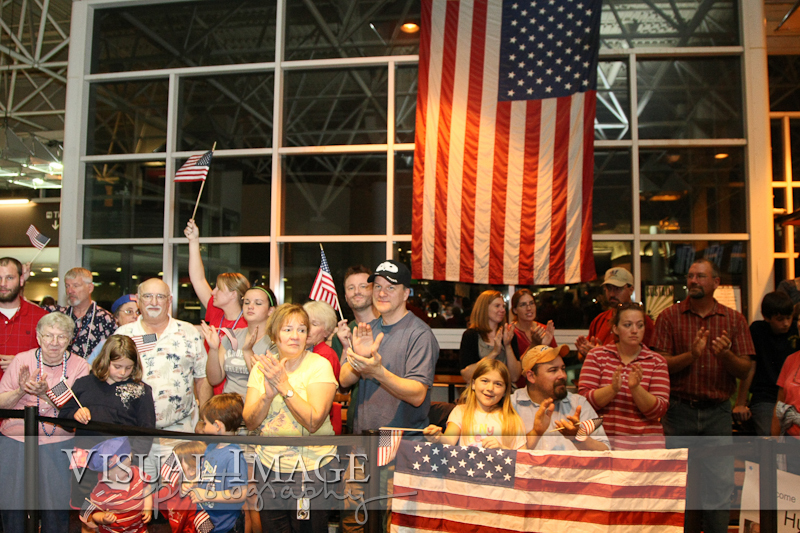 For two hours as the veterans made their way from the gate to the concourse, the military personnel currently serving our country saluted as the veterans from WWII made their way past them, down the walkway, where they were cheered for by the largest crowd to ever welcome home these heroes. 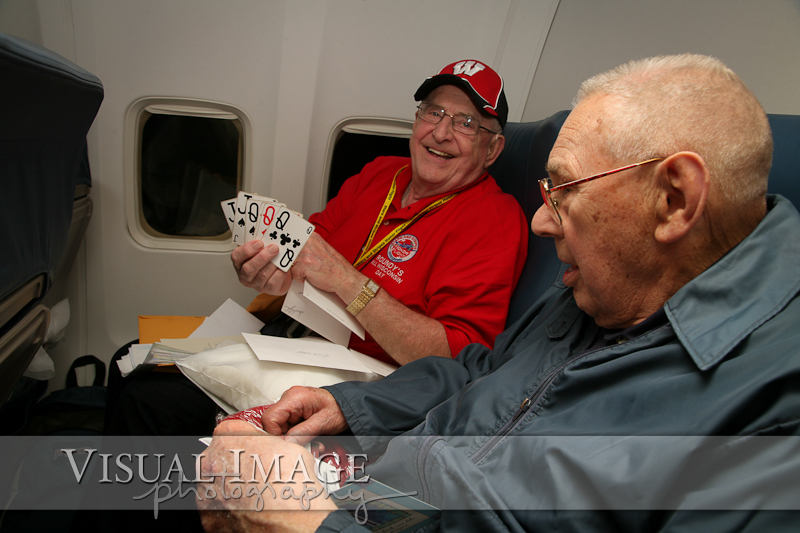 Jerry Luterman described the experience of photographing the homecoming best on his Wisconsin Trails blog post that you can read here. 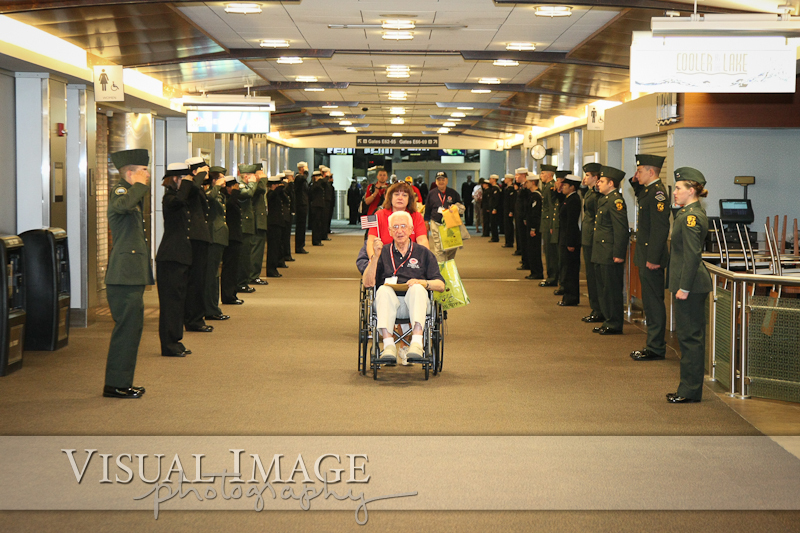 Everything about the trip was an amazing emotional journey with the veterans, but seeing the heroes welcome that they received was truly an amazing way to conclude this trip. 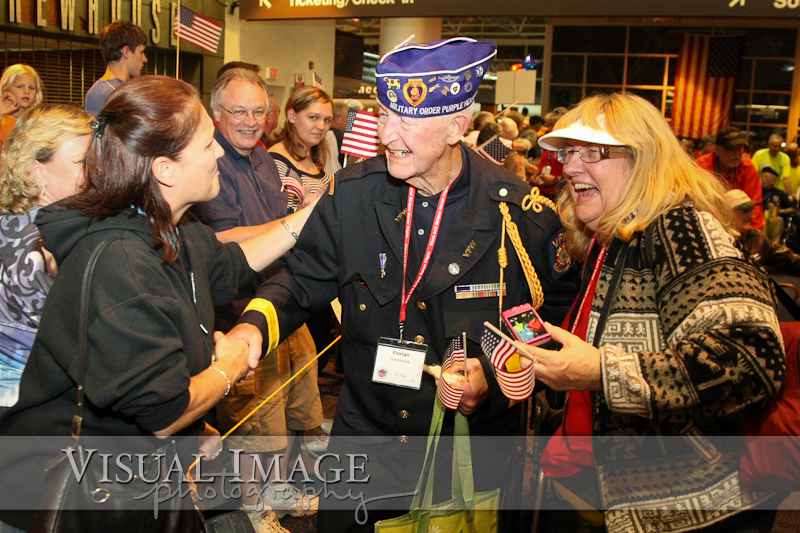 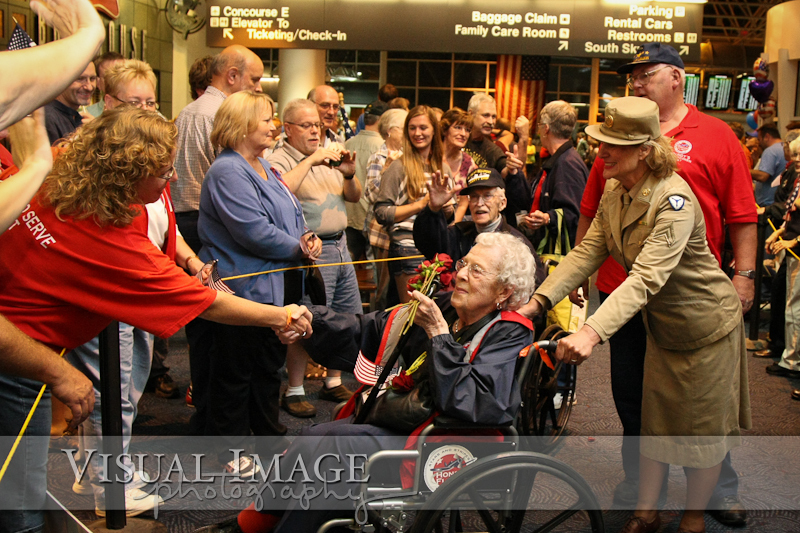 Click here to see pictures of the October Honor Flight departure and tour of Washington, DC. 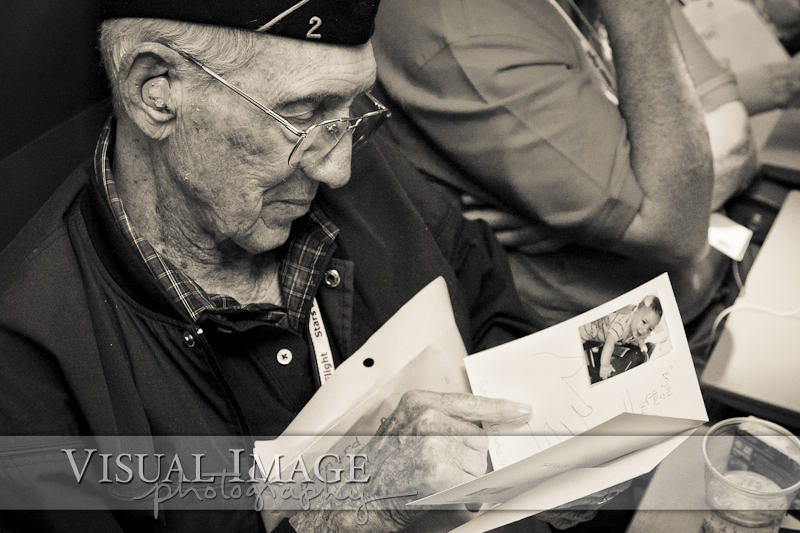 Carl Zimmerman reads names on packages during mail call with his son Richard. 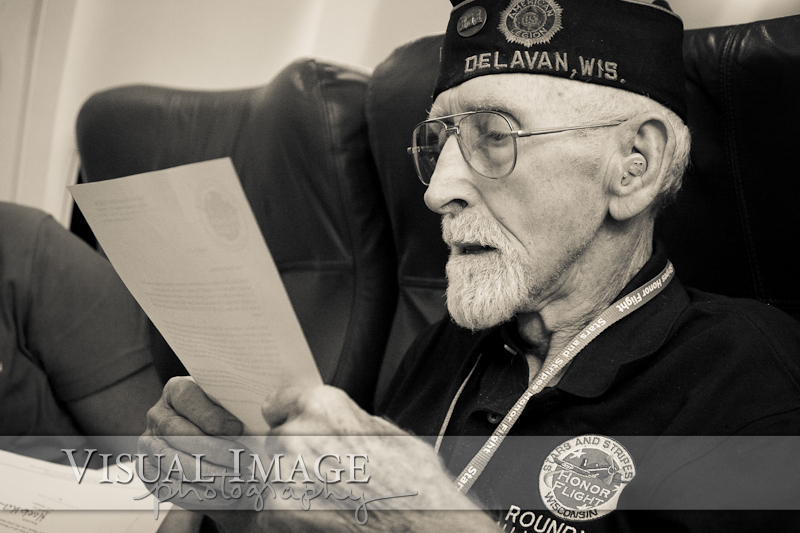 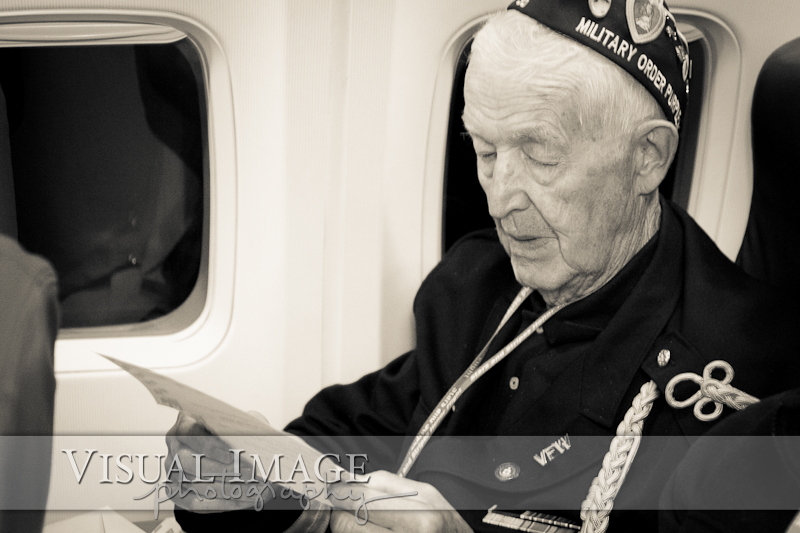 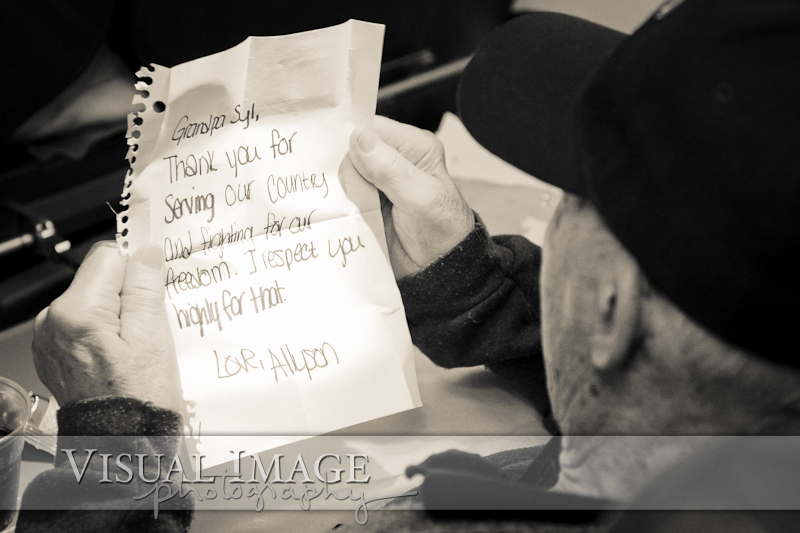 One of the veterans spoke for many when he was reading his mail on the return flight. 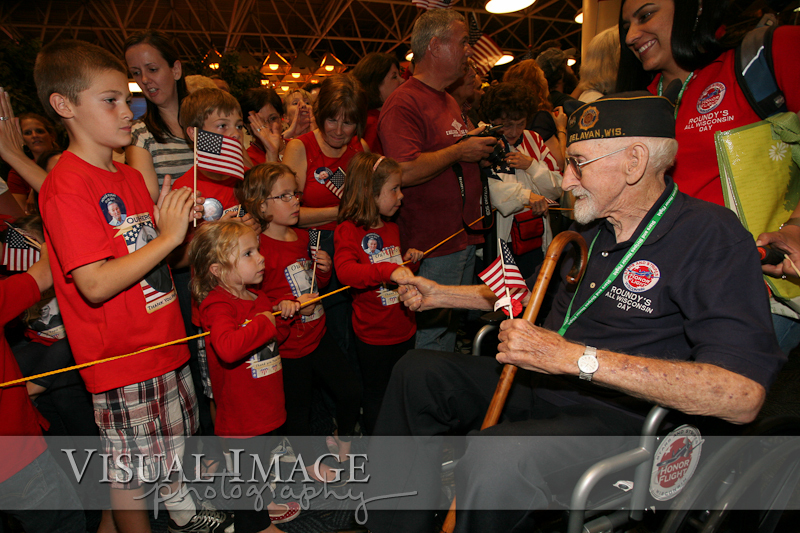 He expressed humility and amazement over everything Stars and Stripes had done for him. 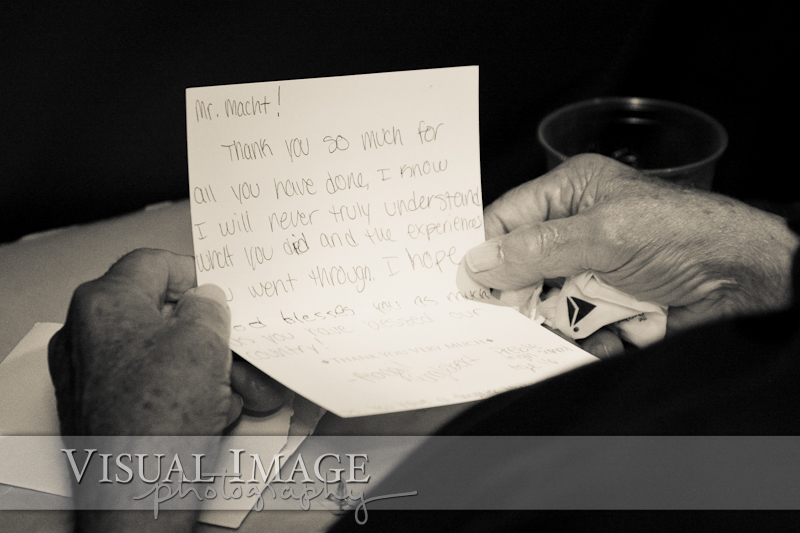 I thought to myself, Sir, how could we do anything less for someone who gave so much? 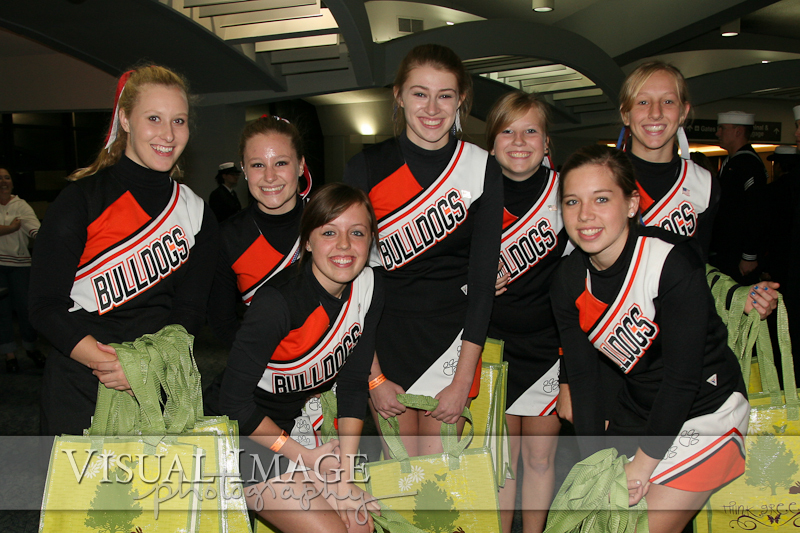 Cheerleaders from Cedarburg High School helped greet the veterans as they entered the airport. 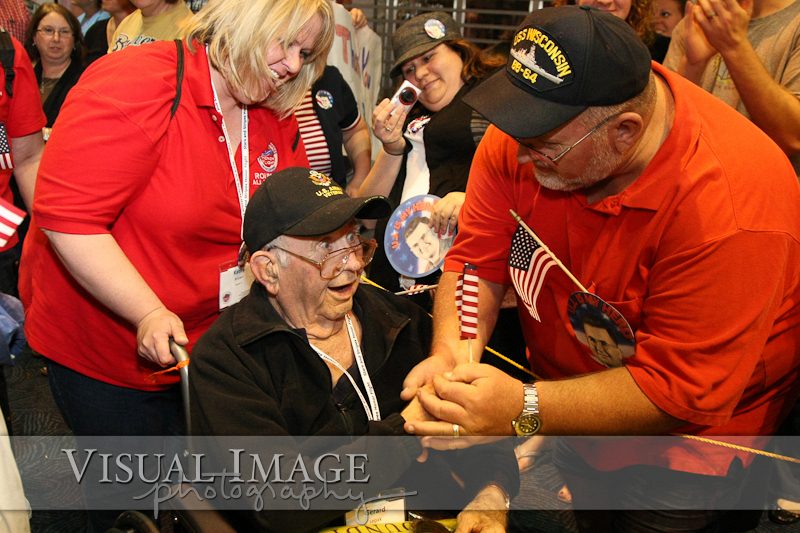 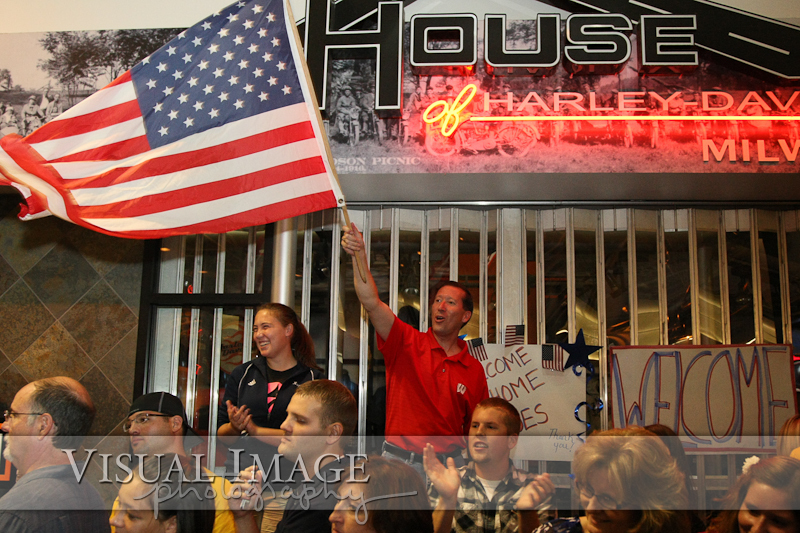 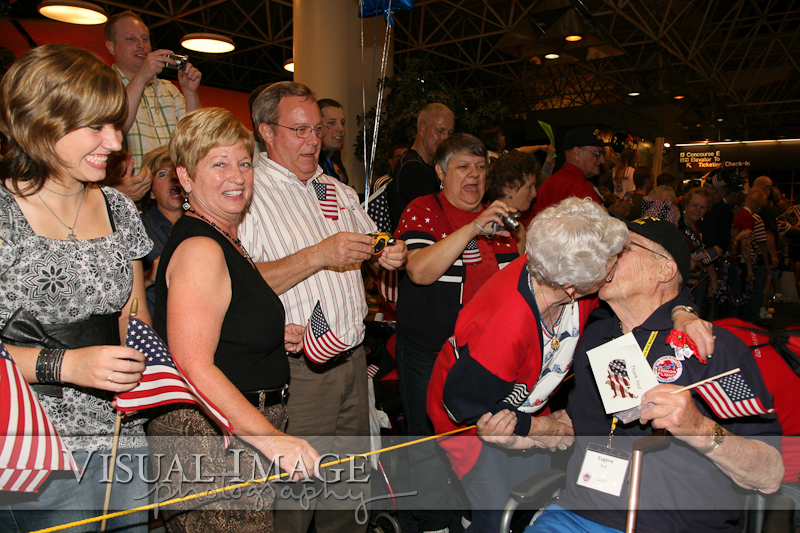 Click here to see pictures from the May 2011 Honor Flight. 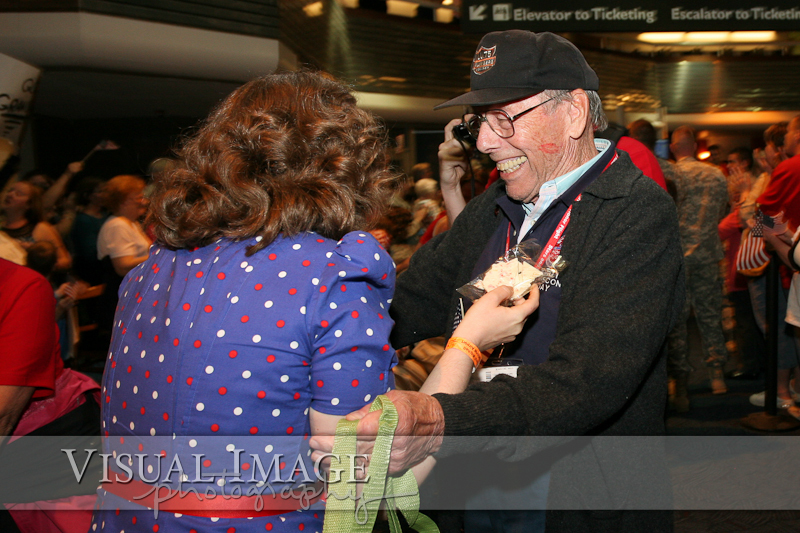 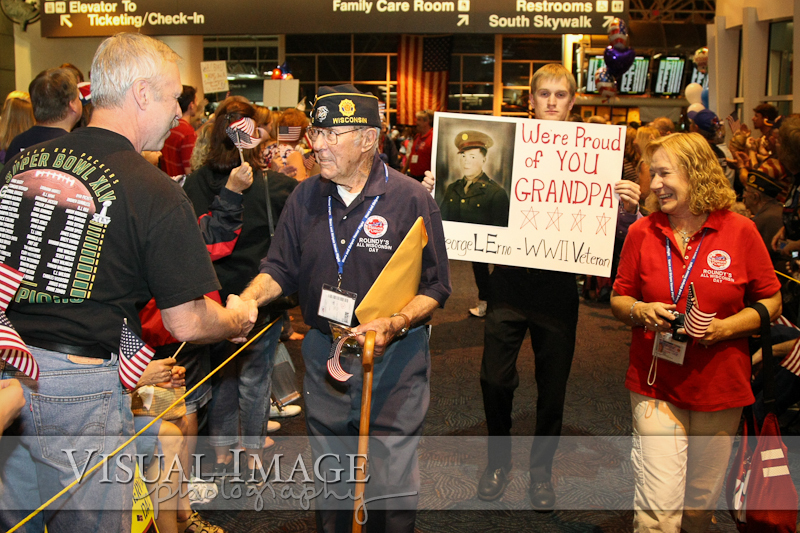 Click here to see pictures from the April 2011 Honor Flight. 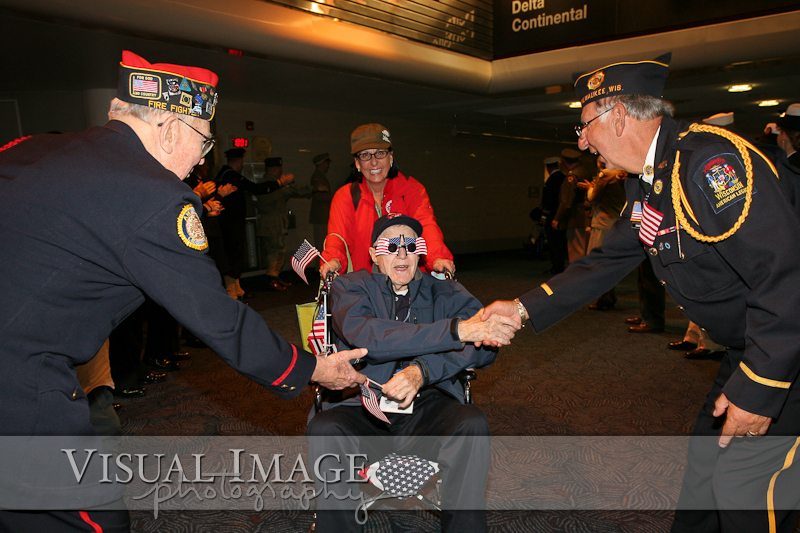 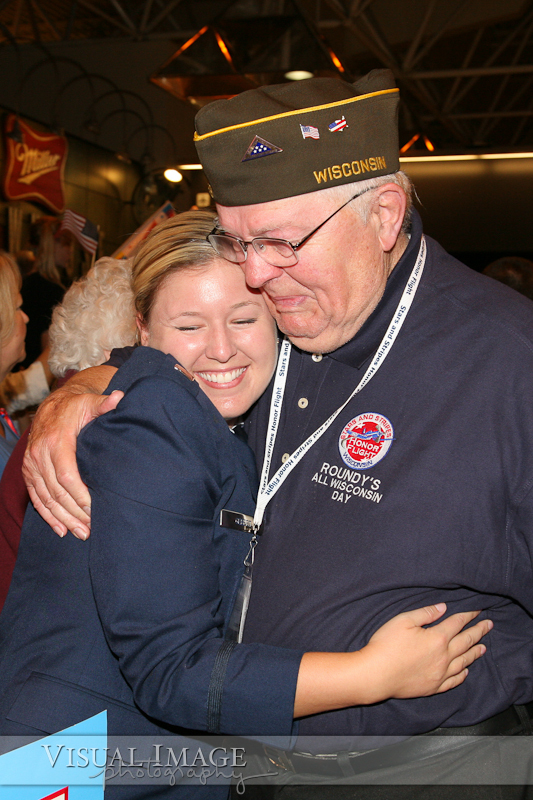 Click here to see pictures from the November 2010 Honor Flight. 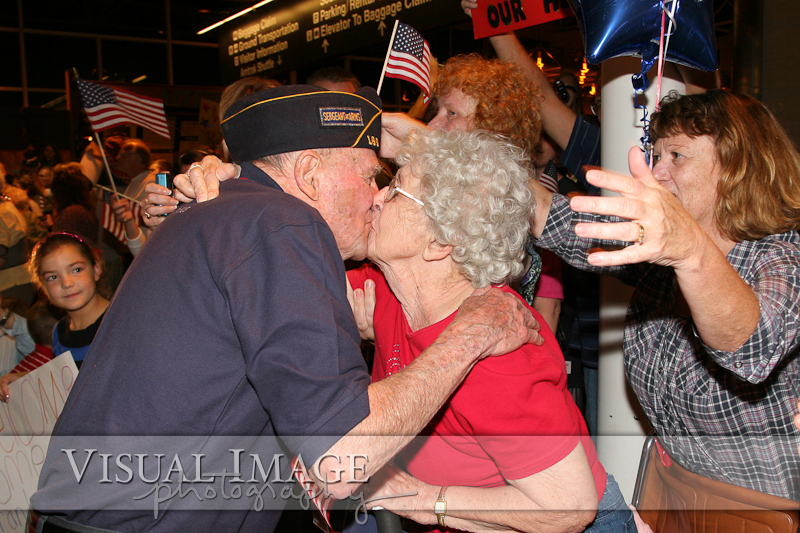 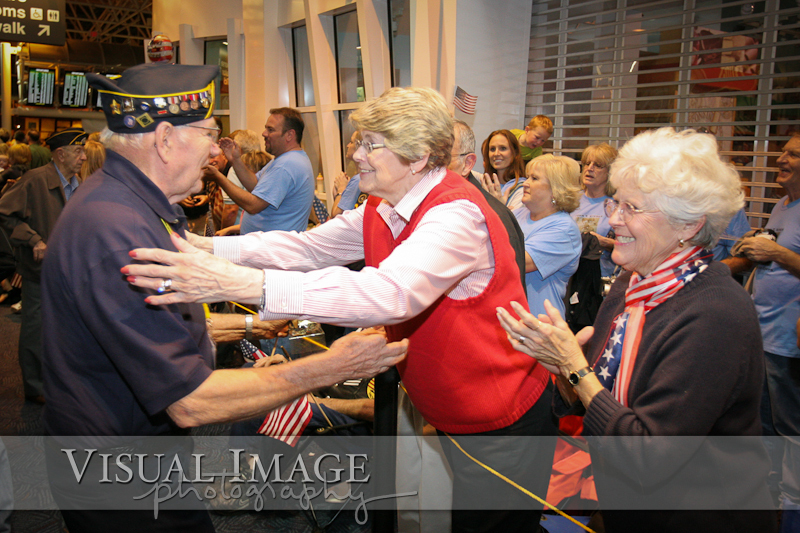 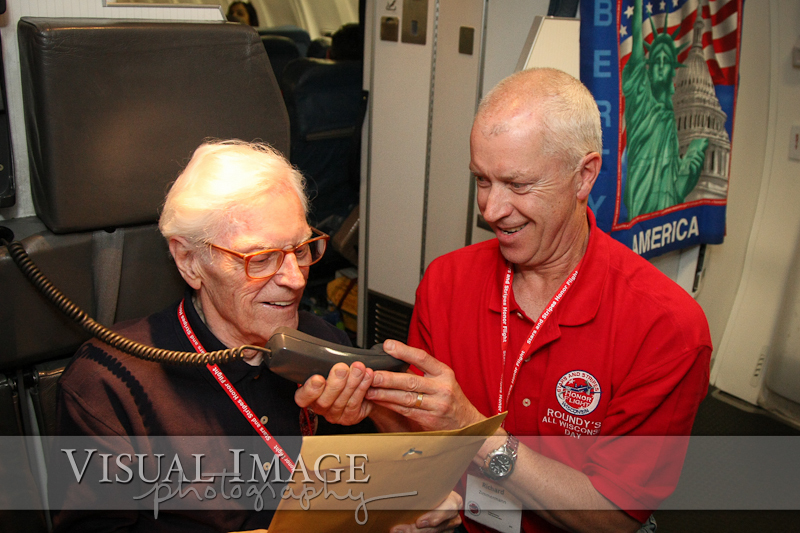 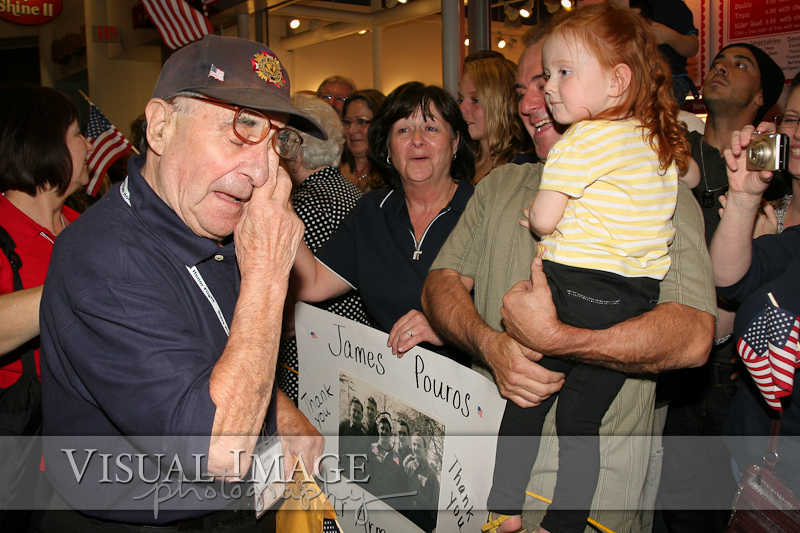 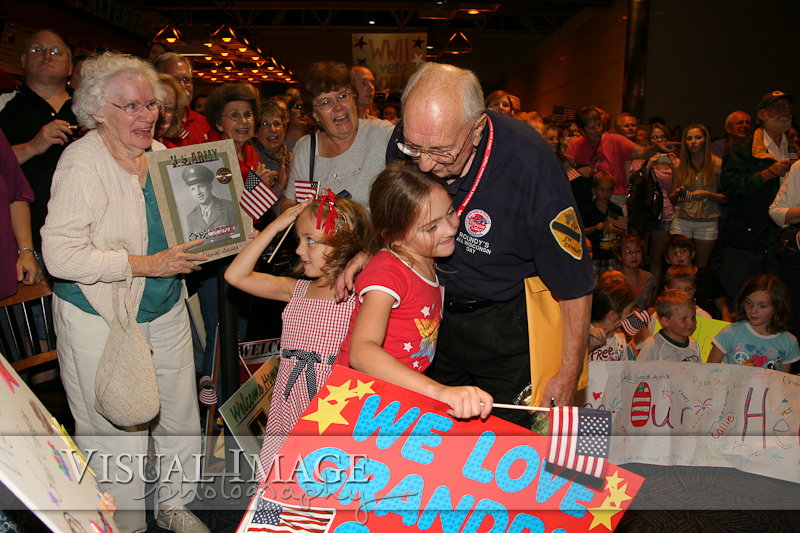 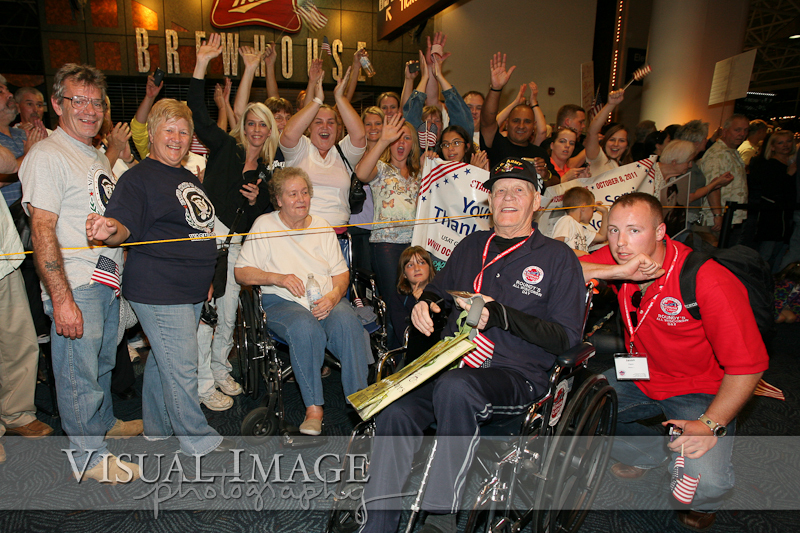 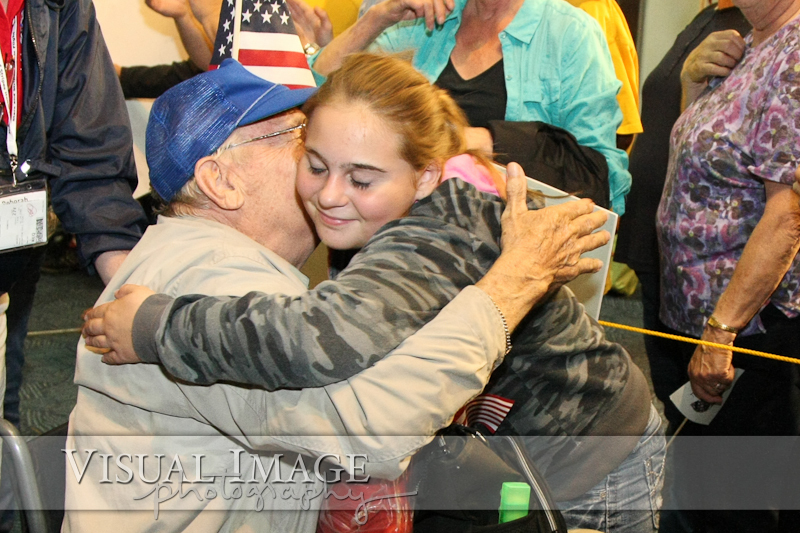 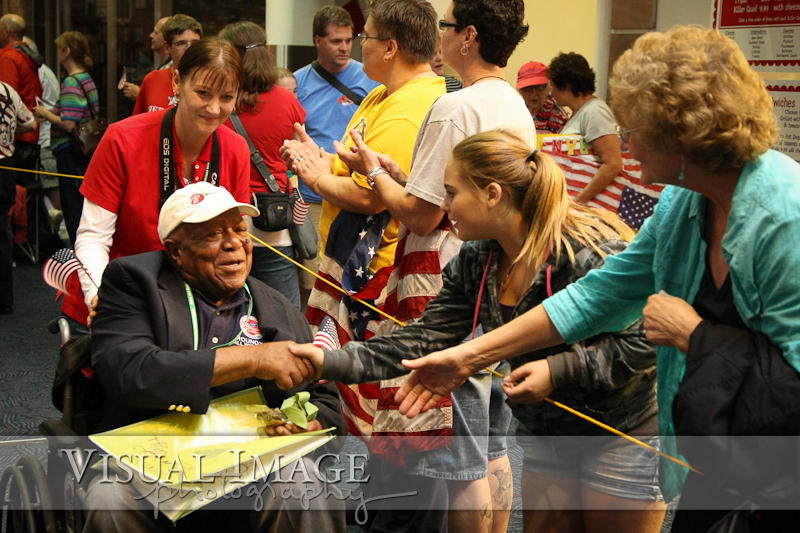 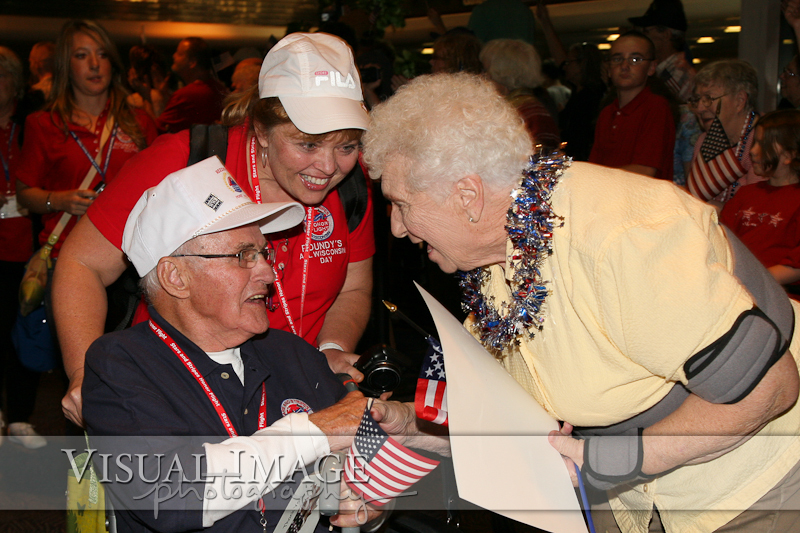 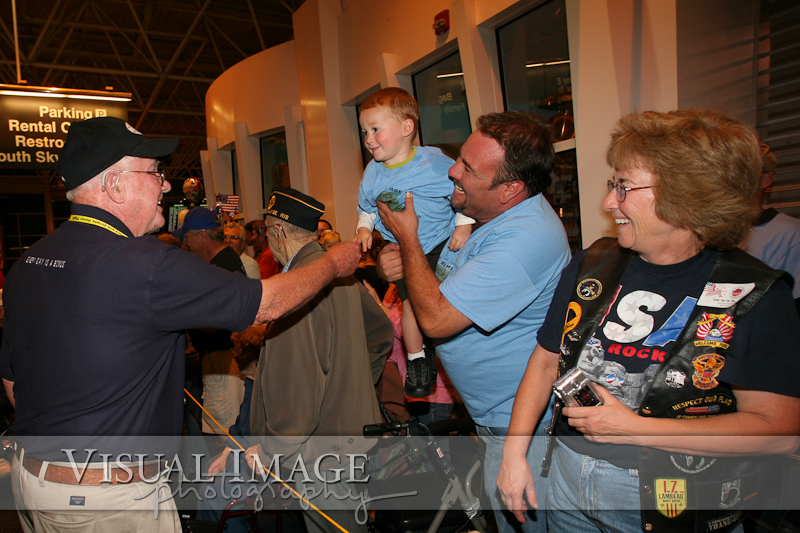 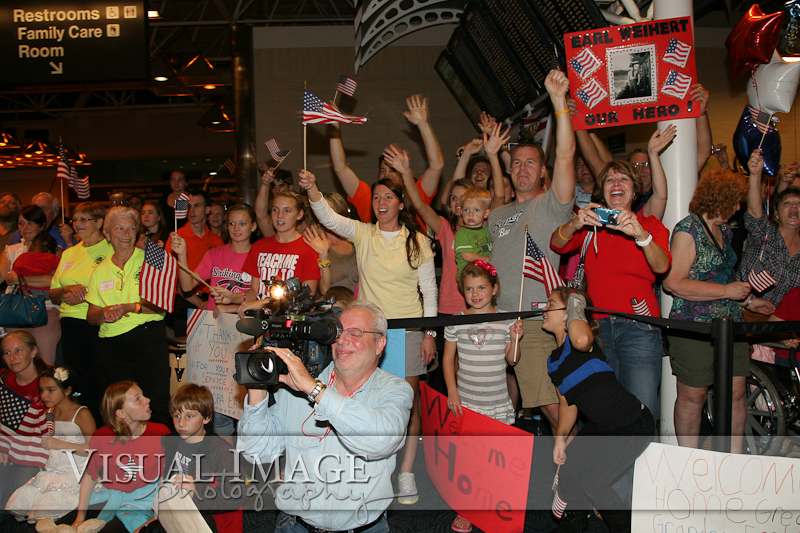 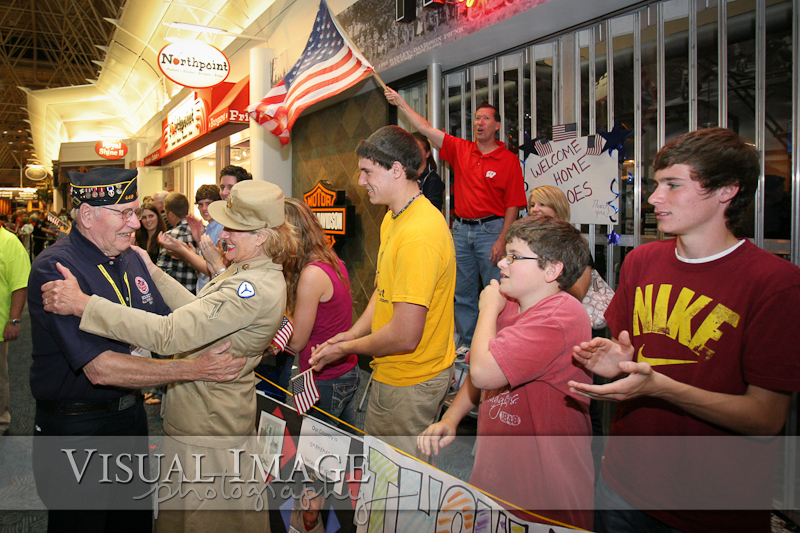 Click here to see pictures from the September 2010 Honor Flight.